USB 2.0 (High-speed USB) provides additional bandwidth for multimedia and storage applications and has a data transmission speed 40 times faster than USB 1.1. To allow a smooth transition for both consumers and manufacturers, USB 2.0 has full forward and backward compatibility with original USB devices and works with cables and connectors made for original USB, too. Supporting three speed modes (1.5, 12 and 480 megabits per second), USB 2.0 supports low-bandwidth devices such as keyboards and mice, as well as high-bandwidth ones like high-resolution webcams, scanners, printers and high-capacity storage systems. The deployment of USB 2.0 allowed PC industry leaders to forge ahead with the development of PC peripherals to complement existing high-performance PCs. In addition to improving functionality and encouraging innovation, USB 2.0 increases the productivity of user applications and allows the user to run multiple PC applications at once or several high-performance peripherals simultaneously. The USB 3.0 (SuperSpeed USB) standard became official on Nov. 17, 2008 [source: Everything USB]. USB 3.0 boasts speeds 10 times faster than USB 2.0 at 4.8 gigabits per second. It’s meant for applications such as transferring high-definition video footage or backing up an entire hard drive to an external drive. As hard drive capacity grows, the need for a high-speed data transfer method also increases. 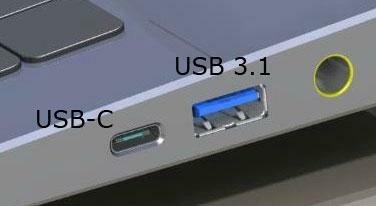 USB 3.1 – Released July 2013. Power provides up to 900 mA / 5 volts / 4.5 watts / practical max length 9.8′ / full duplex works with both existing 5Gbps USB 3.0 hubs and devices, as well as USB 2.0 products. 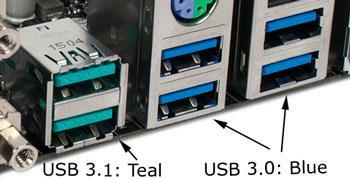 USB 3.1 to USB 3.0 or 2.0 may require adapters or cables. USB Type C or USB-C Cable-Power provides up to 1.5 or 3 amp / 5 volts / 7.5 or 15 watts / 24 wires in the cable. Developed at roughly the same time as USB 3.1 , but distinct from it, the USB Type-C defines a new small reversible-plug connector for USB devices. The Type-C plug connects to both hosts and devices, replacing various type-B and type-A connectors and cables with a standard connection. In other words the connections are the same on both ends of the cable with a pure USB-C cable. USB-C is not a new type of USB port but a new type of cable to connect USB. This is still new to the mainstream and peripherals and devices are slow to adopt as of July 2015. Type-C USB is backward-compatible with USB 3.0 and USB 2.0, but adapters or cables are required. On top of that there will be adapters to make Type C hosts and devices work with existing USB devices. Pure Type-C USB also allows for bi-directional power, so apart from charging the peripheral device, when applicable, a peripheral device could also charge a host device. So this one cable can transmit data as well as charge a device. The throughput on a USB-C connected device is relative to it’s connection type. For example a USB 3.1 with Type C cable is still 10 Gbps (see above), the Type C cable just simplifies the cable connection to that port. A USB 2.0 with Type C cable is still 480 Mbps etc. eSATA – This is merely an external version of internal SATA 1, 3, or 6 connections (see table at top of page). Internal SATA ports are right on the motherboard, eSATA ports are usually on the back of the computer near the USB ports. eSATA ports are red in color and depending on your motherboard capability they could be either 3000 or 6000 Mbps in speed. These ports are typically found on external hard drive products. eSATA ports are used to connect directly to an external storage device or to another computer transmit data at blazing speeds. eSATA would be a good port to use for an external hard drive backup solution for very fast backups of large files. Max recommended cable length, 3ft.